Sawbridgeworth, Harlow & Bishops Stortford paintball. Kids paintball party. Paintball, Childrens paintball, Laser tag in Sawbridgeworth. Ideal for paintballing in Harlow and Bishops Stortford. Welcome to our Sawbridgeworth paintball site, close to the towns of Harlow & Bishops Stortford. 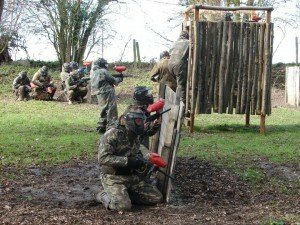 We offer a whole range of paintballing games including Paintball, Childrens paintball, often called mini paintballing, and laser tag at our site less than 10 minutes drive from Harlow and Bishops Stortford. 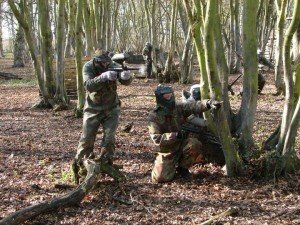 The amazing Sawbridgeworth paintball site is set across 30 acres, in a 60 acre woodland, and has a minimum of 5 playing zones in use at any one time. With the towns of Bishops Stortford & Harlow so close by it’s the perfect choice for Stag & Hen parties, children’s birthdays , corporate days and fun days out with your mates. At Sawbridgworth paintball we only work with the best teams to ensure a fun filled day for all who attend. Childrens paintball and Laser tag both begin at 8 yrs old. For all players over 12 yrs you’re ready for adult paintball or Laser so why not come and have some fun. RW Paintball offer straight forward, honest paintball pricing so you get no nasty surprises on the day. Our site is open for most weekends so get in touch to book your place. We can even open for larger groups and corporate paintball days during the week upon request. Click here to book now online or call us on the numbers at the top of this page. In the ideal location for travel from Bishops Stortford & Harlow, we are based in Sawbridgeworth just a few miles from each. RW Paintball is perfectly placed for access from the A10, M11, A120 and A414 making travel easy from Stevenage, WGC, Hertford, Ware, Hoddesdon, Royston, Buntingford, Braintree & Chelmsford. If your are looking for Paintball near Bishops Stortford or Paintball near Harlow we are your first choice. To Find Paintball Harlow: Travelling towards Harlow from the A10, at the end of A414 do not turn right to Harlow, continue straight over the roundabout toward High Wych & Gilston. Follow that road for a few miles until you reach a t- junction signed for Harlow or Sawbridgeworth (Bishops Stortford) and turn left toward Sawbridgeworth. Continue through the village, over the double roundabouts and approx 1 mile along road, past the swimming pool take Parsonage lane on the left. Follow this lane all the way up past the double bend and, further up, the fisheries (on your right) and you will see the woods set back on your right. The gates will be open (again on the right hand side) and will have our sign there. Please only use this gate not the fisheries gate leading to the fishing lake- We are around a mile further up the road. From Bishops Stortford take the A1184 towards Harlow/Sawbridgeworth and stay on this road until you have passed Spellbrook. Look for Parsonage lane on your right and take this turning. Follow Parsonage lane all the way up past the double bend and, further up, the fisheries (on your right) and you will see the woods set back on your right. The gates will be open (again on the right hand side) and will have our sign there. Please only use this gate not the fisheries gate leading to the fishing lake- We are around a mile further up the road. Head through the gates and once on the track, follow it all the way through the woods until you see the lake on left and grass on your right. There will be a gate in front of you. You have arrived. Please park on the track but be careful as the grass can be difficult when wet. DO NOT drive fast along this track. It is not owned by us or any of the companies we work with at the site. It has some hidden dips that could damage your car. Suggested speed is 5mph. We cannot accept any liability for damage caused to vehicles using this access track. This is our nearest site to the Old Wargame Paintball Hertford Heath paintball site, being just 12 miles away. Map below shows approximate location of our site, see directions above for details. This location is also close by for Harlow Paintball and Bishops Stortford Paintball and features on our things to do in Harlow page.